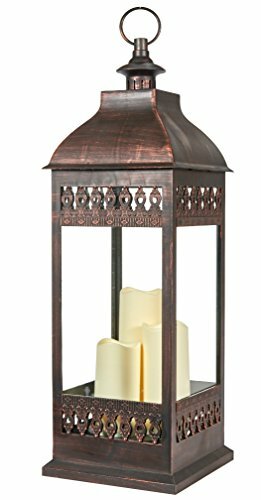 This statuesque lantern is sure to be a conversation piece in any home. Standing 28.5 inches tall, the San Nicola features triple pillar amber LED candles which illuminate to create beautiful, warm and ambient mood lighting. Lantern features an on/off switch with a six hour timer. Simply activate timer mode at the desired time and the lantern will stay on for six hours, turn off for 18, and then illuminate again at the same time every day. Includes heavy duty metal rod and ring for hanging the lantern. Poly construction with real glass. Easy to use indoors or outside. Requires two C batteries (not included).Smart Living Home & Garden offers a wide selection of indoor and outdoor living products, including battery powered LED candle lanterns and fountains, hammocks, umbrellas, and protective outdoor furniture covers. All of our products are high quality and made to help you create the relaxing outdoor oasis or candlelit indoor sanctuary of your dreams!